Today is Thursday, and on Thursdays in Sweden it is a tradition to eat pancakes. I ate 6 pancakes today. But this made me think about how many pancakes other people eat. So I googled, and this is what I came up with. I ate 6 pancakes, You ate X pancakes? Graph made using GD for perl. Here we can see that eating just a few pancakes is the normal thing to do, and that eating two pancakes is the most popular thing to do. Then there seem to be some who use 10 as a big number if they have eaten a lot. However, I thought I had to examine this further. So I continued checking number of google hits. As I expected, 20 was the next big number for those who wanted to brag about how many pancakes they ate. But then nothing happened until 33. I ate 6 pancakes, Olivia Wilde ate 33 pancakes. 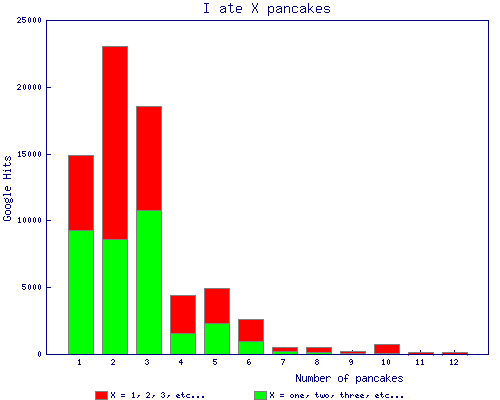 Graph made using GD for perl. 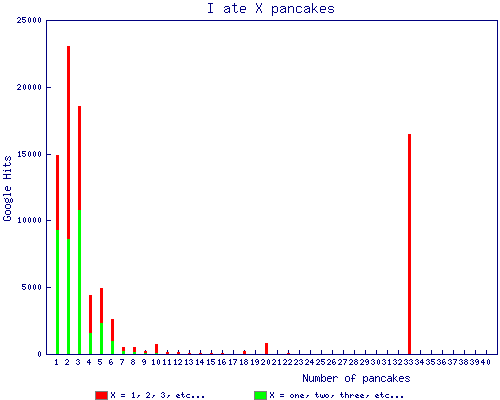 Why is eating 33 pancakes almost as popular as eating a few? The answer is that a lot of websites writes that Olivia Wilde (known from House and Cowboys and Aliens.) once ate 33 pancakes in 20 minutes. Olivia Wilde at a San Diego Comic-Con panel for Tron Legacy in July 2010. Image from Wikimedia. Creative Commons Attribution 2.0 Generic license.